We welcome you to the Spring edition of our Newsletter. The first one is with Renasa Insurance who was crowned as the Commercial Insurer of 2016 by the FIA. The company is very innovative and has launched an excellent solution how motor vehicles can be insured on a new price basis. You will find more information on the IVP product from Renasa under the section “short-term insurance” below. The second partnership is with Investec Specialist Bank. As mentioned in our newsflash, the bank has granted us access to their attractive money fund and fixed deposit offerings. Further details can be found under “Investments”. As usual, we have also included information across the board regarding immigration, taxes, and other related topics. As usual, this newsletter can be viewed under http://www.swissfin.co.za/en/newsletters/swissfin-newsletter-september-2017/. Corporate Sure no longer insures buildings under R 10 Mio. Car accidents – please take note! Which city offers the best quality of living? The minimum investment is R 250’000. Terms and conditions apply. The rates do fluctuate on a daily basis and the interest rate depends on the investment amount. Underlying assumptions: 6.5% effective interest. Couples married in community of property can double these amounts. As mentioned in the introduction notes to this newsletter, we are excited to announce the new partnership with Investec Specialist Bank. Our core offering is the well-known Corporate Cash Manager platform, which allows us to manage your cash investments. The current effective yield of the money fund as of end of July was between 7.38% and 7.73% depending on the investment amount. Investec Specialist Bank does not charge any monthly account fees. Debit orders can be loaded against the account. Funds are available on call by sending us an e-mail or by calling us. The minimum investment amount is R 250’000. Please note there are no credit cards, ATM withdrawals or internet banking facilities attached to the account. Please note that all the rates are for indication purposes only and terms and conditions apply. South Africa has been hit by another blow with the news that it has slipped into a technical recession after its gross domestic product (GDP) declined by 0.7% during the first quarter of 2017 after contracting by 0.3% in the fourth quarter of 2016. South Africa’s growth has been slipping sharply since 2011 compared to global peers. For the past few years, population growth has also outstripped economic growth which implies that, on a per person basis, the country actually got poorer despite having positive economic growth. On a more positive note, it was certainly a happy Friday on 20 July for all SA’s indebted consumers, as South African Reserve Bank Governor Lesetja Kganyago cut interest rates by 0.25%. The Governor cited SA’s improved inflation, which slowed to 5.1% in June, down from 5.4% in May, but in contrast with a deteriorating growth outlook. The SARB also lowered their forecast for 2017 GDP to 0.5% from 1%. The news was not positive for the Rand, which weakened shortly thereafter. Please also note that provisional taxpayers have to submit the second return by the end of August 2017. Please take note that our office no longer attends to the submission of tax returns on behalf of our clients. We have managed to find an alternative solution, which is ideal for our German speaking clients. Mr Wilfried Orman, a chartered accountant based in Green Point, has offered to take over our tax clients. or call Mr Orman on 021-4394254. Taxpayers are struggling with some of the changes to the new tax returns and described it as less user-friendly as anticipated. The medical and retirement annuity sections on the income tax return form have changed significantly and SARS only published the guide to complete the new return after the filing season started. The new section for retirement annuities requires that each policy should be completed separately (name of fund, policy number, contributions made to that particular fund). The total amount must then be filled in next to “Total contributions for this year of assessment” (tax code 4006) at the top of the section. This insurer has launched a new product called “Inception Value Policy” (IVP) that allows you to lock the current retail value on your vehicle; therefore the value does not depreciate over the duration of the policy. The benefit is a top-up-cover to an existing comprehensive motor insurance policy. It is a standalone product based on the current TransUnion retail value and can be linked to any insurance company. The premium rates are based on the value of the vehicle which starts from R 85 p.m. Considering the low premium, we recommend all our clients to take out this cover. The development of drone technology has resulted in a multi-billion dollar global industry. A review by the regulator of the South African Aircraft Register over a 12-month period shows an increase in the number of registered drones, from 216 in January 2016, to 465 in January 2017. There are certainly many more that are not registered by the owners. To secure the appropriate short term insurance cover, private and commercial drone operators must adhere to the Civil Aviation Act that governs the use and operation of these unmanned aircrafts. Recreational drone operators should take particular note that insurance under most general personal policies does not cover the aircraft while flying. This also means that any legal liability claim is excluded from the standard domestic policies. It is advisable for all drone owners to speak to our short-term insurance department to make sure you have adequate insurance cover in place. – There is an early settlement by mutual agreement. Old Mutual Insure believes that this decision will assist in keeping customers’ premiums as low as possible. The insurer has for a number of reasons, including operational efficiency, profitability and enhancing customer service, decided to no longer insure property schemes with building sums insured of R10 million and under. Further to this, the company has adjusted their internal rating models to be more competitive in the larger property schemes market. Going forward, active policies with building sums insured of R10 Mio. and below, will be cancelled with effect from the renewal date. The company has announced an enhanced wording. For all Hollard clients, please click here to view the changes. - Make sure to get all the relevant information at the scene and to give yours to the other party involved. This includes full names, ID numbers, addresses, telephone numbers, vehicle registrations, descriptions of the vehicles, details of police and traffic officers, ambulance personnel and details of tow truck personnel. – Please note that only approved tow trucks are to be used. In case of an accident, to have your vehicle towed, please call the insurance company’s emergency number for their assistance. – Take pictures of the accident scene. – Most importantly, obtain a statement from an independent witness on how the accident occurred. Nobody needs to admit liability, but the statement (with a sketch of the accident) should be signed off by the witness including his/her contact details. – Report the accident to the police within 48 hours to get a case number. This information will assist in a more efficient recovery process to claim from the third party if you were not at fault. It happens on a regular basis that third parties admit liability at the accident scene, but then report conflicting information to their insurance company. Unfortunately, the recovery process can easily take up to 36 months, even if all the data is complete. Due to an influx of new business, the valuations for buildings and contents have fallen into arrears. The backlog is currently a few months and MUA is training new valuators and outsourcing some of the work. All new clients will be informed directly by MUA and no client will be prejudiced, should a claim occur whilst waiting for the valuation to be done. General work visas are proving virtually impossible to renew, since the implementation of the current immigration laws on 26 May 2014, when the Department of Labour took on a more significant role in the process. Applications are regularly rejected for reasons not given or because the Department of Labour has found that issuing the visa could discriminate against South Africans, even in cases where the applicants’ jobs depend on them being fluent in a language not spoken in South Africa. The Department has added layers of bureaucracy and inconsistency in carrying out directives and applying the law, compounding delays in a process already fraught with hurdles. There are regular reports of professionals who have lived and worked legally in South Africa for years, now denied renewed work visas and facing the prospect of losing their homes and jobs and disrupting their families. We recommend, whenever possible, that new applicants pursue the Critical Skills Visa category, because the General Work Visa has a success rate of only 4%! A further advantage of the Critical Skills Visa is that no job offer needs to be submitted with the application and once the applicant is employed, he can immediately submit an application for permanent residence. There is never a dull moment with the Department of Home Affairs and many times we only find out that new rules have been introduced when clients encounter a problem. One of the latest changes is the certification of the PR document. The certified copy now may not be older than 3 months! One of our clients has scanned his ID book to his smartphone and presents this in addition to the PR certificate. It has been tested multiple times and welcomed by the Immigration Officials. It is a requirement in terms of the Births and Deaths Registration Act, that all births must be registered within 30 days of the birth of a child. If this is not complied with then any birth registration thereafter is deemed to be a late registration of birth, which is a complex process. Provision is made in the new dispensation for registration after the 30 days, from under one year after the birth, from one year up to seven years and finally from seven years and above, with the requirements becoming progressively more difficult, the longer the applicant waits. The number of temporary residency permits awarded to foreigners has halved since 2012‚ while permanent residency figures have multiplied by nearly five times. A survey of the most recent documented immigrants‚ released a few weeks ago by Stats SA‚ showed that after visitor permits‚ relative‚ study and work permits were the most popular among foreigners applying for temporary residency in 2015. Work‚ relatives and business topped the list for permanent residency applicants‚ with refugees fourth. The Department of Home Affairs approved more than 6000 permanent residency permits in 2015 compared to 1283 in 2012‚ but the number of temporary permits issued nearly halved from 141550 to 75076. One needs to take into consideration that the Department worked off a huge backlog of permanent residence application in 2015, which means that the above figure is not a true reflection of a trend. Indians were qualifying on the basis of being critically skilled and credible applications for spousal working visas and critical skills visas were usually the most successful. The submission of applications abroad is still problematic, as there is absolutely no consistency in the handling of the documents. Often officials come up with strange requirements that are not anchored in any Act or Regulations. What worked the day before might not work the next day. – Translators may no longer use their electronic stamp and signature, but have to stamp and sign it physically. – The radiological report needs to be done by a qualified radiologist. A doctor or a clinic with an X-ray machine may not be accepted. Please share your experiences with us so that we can inform all our clients of any new hurdles. When applying for an ID book, the Department first needs to make sure that the PR certificate is not fraudulent. Recent experiences have shown different processing times for the verification, anything from 6 weeks to 6 months. All certificates issued after 1 October 2014 will have a certified copy attached. This one can be used for the verification process.
. Please mention the location of the Department of Home Affairs where you want to apply for the ID book. Head office will then mail that specific office with the result. Please make sure the file is not larger than 2 Mb, as the Department’s server might reject the mail. Vienna has taken first spot, in front of Zurich, Auckland and Munich. The annual survey by the international consultancy firm Mercer was recently published for the 19th time. The top spots are dominated by European cities: Düsseldorf (6), Frankfurt (7), Geneva (8), Copenhagen (9) and Basel (10). To determine the rating, Mercer used 39 points in interviewing expatriates that covered infrastructural, political, social, economic, health and educational aspects. At the bottom of the list is Baghdad, accompanied by other war-torn cities. Many tourists are in danger of breaking laws in foreign countries because they have not informed themselves beforehand. - Switzerland: You may no longer flush the toilet after 10 at night if you live in an apartment block. Men should sit and not stand over the toilet when using the facility late at night in order to keep the noise level down. – Singapore: Chewing gums is only allowed by medical prescription. People with digestive disorders or wanting to quit smoking are allowed to chew gum. – Dubai: Kissing or intimacy in public is not allowed. The UAE has issued a pamphlet for all tourists that also reminds of no alcohol or dancing in the streets. Drugs, swearing or spitting is also subject to a fine or imprisonment. – Philippines: The song by Frank Sinatra “My way” is forbidden. The song has apparently caused many fights and even deaths in Karaoke-Bars. – Burundi: You may not walk in a group! The reason is the past civil war, which emanated from people walking in groups. – United States: The “Kinder Surprise” chocolate eggs from Ferrero are banned. The State is concerned that children could swallow the entire piece with the yellow plastic ball inside. If you are caught importing them, you can be fined USD 2500! – North Korea: No jeans or piercing is tolerated, because it is a Western influence that is deemed to diminish local values. Whilst some of these points are amusing, others can get you into serious trouble and a visit to the above mentioned website might be advisable before you travel abroad. We would like to welcome Mrs Claudia Kessel to our short-term insurance team. Claudia is not a newcomer to Cape Town and has been living in the Mother City for many years. She has joined the short-term insurance team as from 1 August. Claudia is also German speaking we wish her lots of satisfaction in her new role. 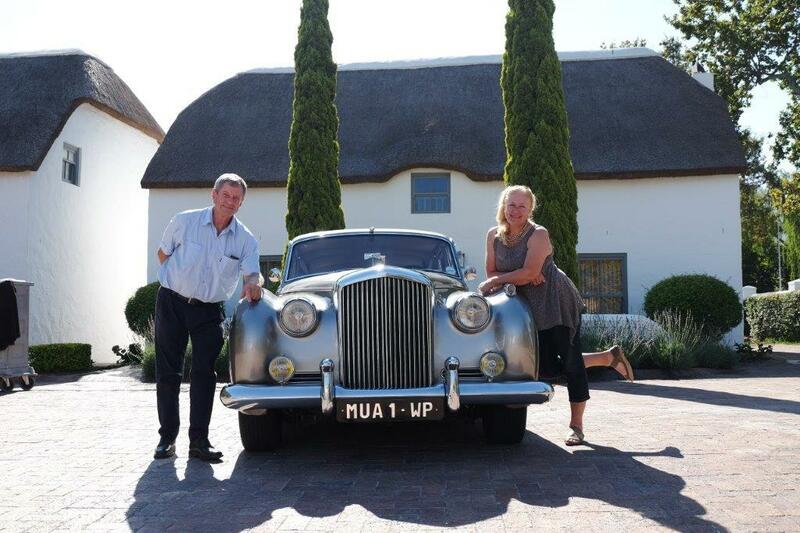 As many of you have not seen the beautiful vintage car that MUA generously offers to the winners at the Captain’s Day, here is a picture of Mr and Mrs van Zyl from Arabella on their outing to the winelands. We can be contacted Monday to Thursday from 08.30 to 16.30 and Fridays from 08.30 to 16.00. Over weekends, please use the emergency numbers of your insurance company. Do you want to know about a specific topic, share something with us or comment? so that we can assist you.